Discovered by iMore, the forthcoming feature streamlines the Safari AutoFill process, which lets users automatically fill in web forms with stored credentials and information. Currently, the AutoFill mechanic in macOS Mojave requires users to click on a text box or field and select corresponding credit card, user name, contact, password or other information from an AutoFill dropdown menu. Alternatively, Mac presents AutoFill suggestions when users begin to fill out a form with information that coincides with credentials stored in Keychain. 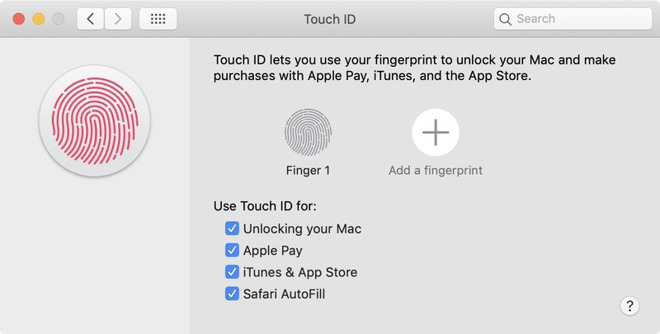 With macOS 10.14.4, owners of MacBook Pro and MacBook Air models with Touch ID can automatically fill out forms by selecting a text box and placing their finger on the Touch ID power button. The feature not only simplifies the AutoFill process, but makes it more secure by requiring Touch ID authentication for passwords and other sensitive information. Further refinements and data management options can be accessed in Safari preferences. To activate the new Touch ID function, navigate to System Preferences > Touch ID and click on the Safari AutoFill button. When Touch ID for Safari AutoFill is switched on, users will see a new Touch ID option at the top of Safari's usual AutoFill dropdown menu. Apple issued the first developer beta of macOS 10.14.4 on Thursday alongside evaluation versions of iOS 12.2, watchOS 5.2 and tvOS 12.1.2.